Congratulations to the referees who received their upgrades and were appointed finals at the 2015 NTL/E8 this was a superb result for the Sydney Scorpions. Team Awards: These Both Caren Friend and Joseph Aboud received team awards from their respective teams for their outstanding contribution to all of the team. Mike Zhurawel, Joseph Aboud, Rod Sawell and Caren Friend for participating in their first NTL. 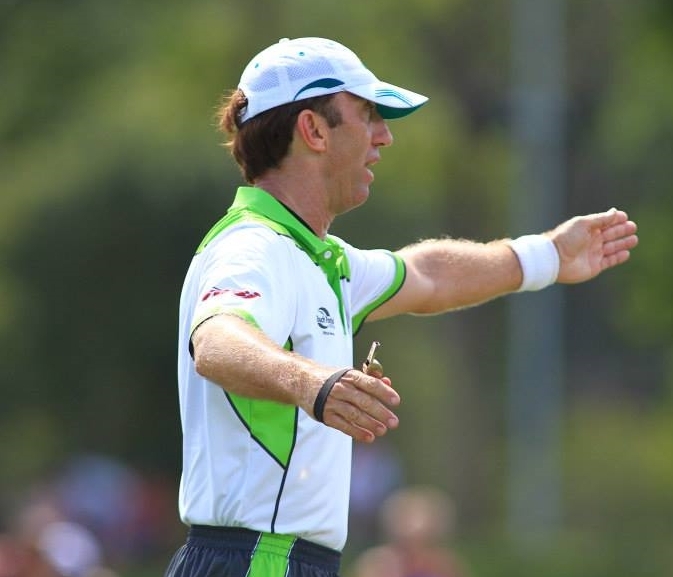 Paul Cini (Referee Coach) who achieved a Level 4 Referee Coach at the NTL’s. Greg West: Director of Referees TFA received a 20 year service recognition award from TFA. Good luck to all referees who will be attending. There is 40 days to go before the 2015 Touch World Cup is being played in Coffs Harbour. The opening ceremony commences on Wednesday 29 April and the finals being played on Sunday 3 May. The following referees have been selected to represent Australia: Bernie O’Donohue, Anthony Smith, Luke Heckendorf, Phil Lowe, Anthony Suters, Luke Saldern, Josh Vernon and Bill Slade. Expression of Interest for the next Level 3 Referee course are being accepted. If you’re keen to do this referee course or know of other referees who are eligible to do the course, I have scheduled a course date for Saturday 27 June 2015. If you are interested, please do drop me an email. To all the referees attending the upcoming Junior Regionals and 2015 World Cup I wish you every success in your endeavours. Ensure the game is enjoyable for all participants. Be prepared to referee on a consistent basis thus ensuring they gain experience. What qualities are being looked for by the assessors. Attend a Level One Course (4.5 – 5 hours) conducted by a Level Two Referee Course Co-ordinator; Successfully complete the written (or verbal) test, with a pass mark of no less than 27/30. Pass an on-field assessment by a Level Two Referee Course Co-ordinator. Correct, Clean and Tidy Uniform; Capable of executing the seven basic signals; Control major areas such as heavy touches, 5 metres; Clear communication; Basic referee positioning. Attend a Level Two Course (6-8 hours) conducted by a Level Two Referee Course Co-ordinator; Successfully complete the written (or verbal) test, with a pass mark of no less than 27/30. Pass an on-field assessment by a Level Two Referee Course Co-ordinator. Look, act and dress like a referee; Have a confident demeanor; Have a sharp, audible whistle tone (start, finish and penalties); Utilise basic signals; Display the correct penalty sequence; Demonstrate obstruction & disciplinary signals (if required); Keep and mark a consistent 5 metres; Keep ‘eyes on the ball’ and move with the ball to be in the next desired position; See touches & keep out of way on the scoreline; Spring when ball is spun wide; Sprint at change of possession (ie 5 metre to 5 metre); Use the off-field referee; Contribute from the sideline (when required). Attend a Level Three Course (6-8 hours) conducted by a Level Two Referee Course Co-ordinator; Successfully complete the written (or verbal) test, with a pass mark of no less than 27/30. Pass an on-field assessment by members of the State Referees’ Panel at a major championship or, by a member of the State Referees’ Panel, Regional Director and members of the Regional Referees’ Panel at recognised championships. Good whistle tone with fluctuating volume – clear, correct for the purpose with crisp delivery; Signals given with authority, correct stance & posture; Signals mainly performed on the run (whilst moving to the next position); Move about the filed with ease and keep up with play by: keeping close to the ball without getting in the way; keeping most players in view at all times.Read play and anticipate to stay ahead of play; Establish a consistent 5 metres (at all times); Enforce a consistent 5 metres; Use interchange with ease; Use off-field referee for an opinion; Use discreet signals as an off-field referee (if requested); Always stay level with the ball when off-field; Play the advantage rule. Appointment to be made by the State Director of Referees, in conjunction with members of the State Referees’ Panel. The level is awarded upon a practical assessment at a State run championship. Appointment to be made by the State Director of Referees, in conjunction with members of the State Referees’ Panel. This level is awarded upon a practical assessment at an ATA controlled National Championship. Appointment to be made by the Australian Touch Association, after recommendation by the complete ATA National Referees’ Panel. This level is awarded upon a practical assessment at an ATA controlled National Championship. Gratefully accept advice from members of your Referees Coaching Panel, they are qualified to give it; Nothing substitutes for experience. Nominate to officiate at as many championships as you are able to attend; Observe the performance of higher level referees. Discuss refereeing matters with them; Endeavour to arrange a video of your performance, then critically analyse yourself; When observing the performance of a higher level referee, maintain a positive approach and strive to emulate their obvious good points; Maintain a high level of fitness. Physical fitness promotes mental fitness, and give rise to a clear mind, consistent decisions, and less frustration and mistakes; Senior referees – be keen – be seen! Your enthusiasm for the game with be appreciated by your fellow referees, who then will be amenable to approaching you for advice and assistance.